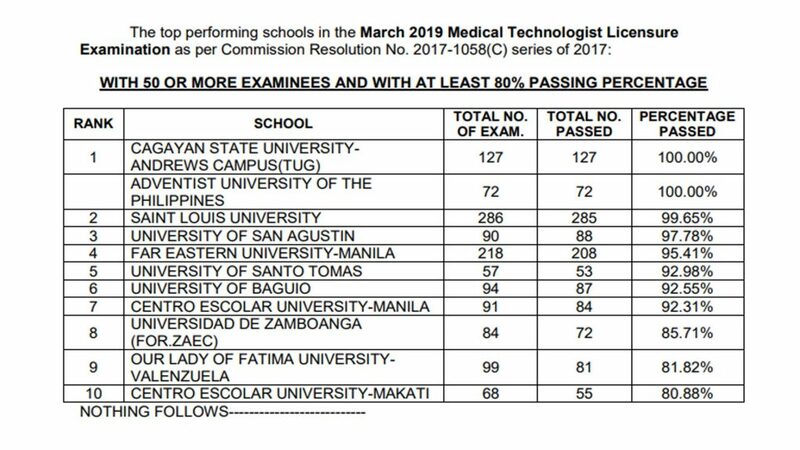 Two universities topped the latest Medical Technology Licensure Examination. Cagayan State University- Andrews Campus (TUG) with 127 examinees and Adventist University of the Philippines with 72 examinees garnered 100% passing rate. 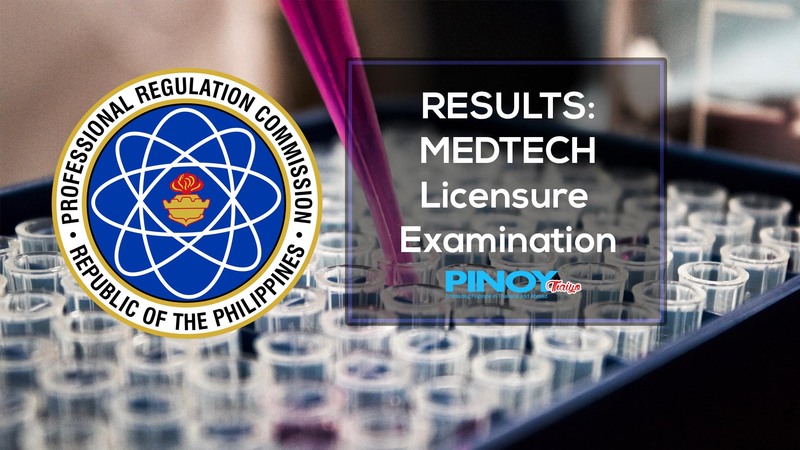 The Professional Regulation Commission announced on Tuesday, March 19 that 2,801 out of 4,092 passed the Medical Technologist Licensure Examination given by the Board of Medical Technology in the cities of Manila, Baguio, Cagayan De Oro, Cebu, Davao, Iloilo, Tuguegarao and Zamboanga this March 2019. 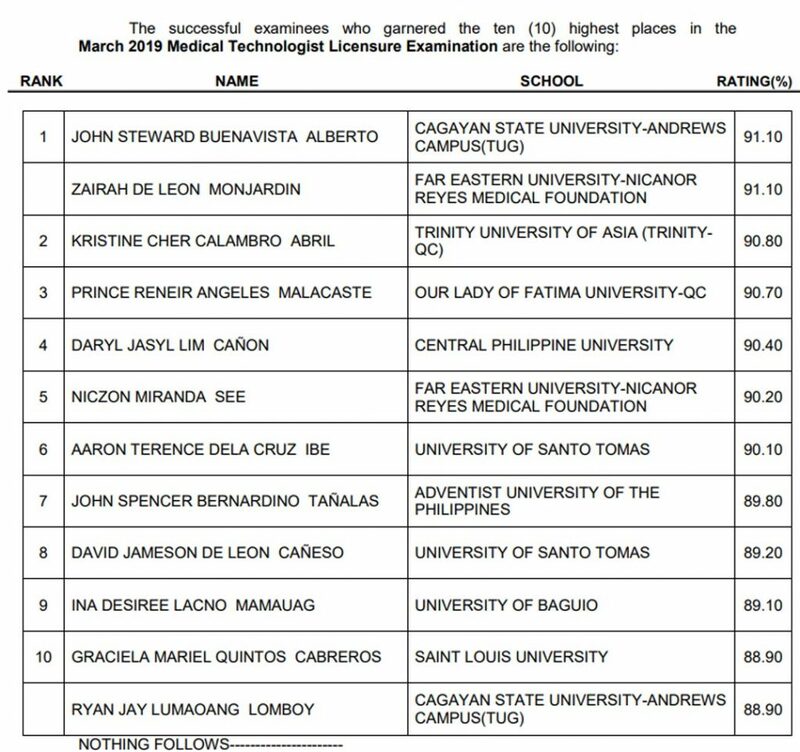 John Steward Buenavista Alberto of Cagayan State Unversity and Zairah De Leon Monjardin of Far Eastern University-Nicanor Reyes Medical Foundation earned the top spot with 91.10%. Those who failed to pass the board examination for Medical Technology but had obtained a general rating of at least 70% can register as Medical Laboratory Technician, according to the PRC.